Polyethylene cross-linked tubing, better known as PEX, is a fine addition to the industrious do-it-yourself plumber’s arsenal. Inexpensive to buy and surprisingly versatile, PEX is also relatively easy to install. No complex soldering or messy gluing is required, and the tubing can be easily “fished” through walls and around corners—try that with copper or PVC pipe! 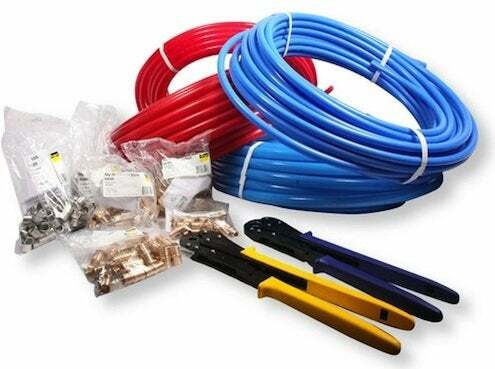 More than 20 different types of PEX are on the market, each suited to a specific plumbing or heating job, so knowing which PEX product to pick for your project is important. Most plumbing applications, especially those involving potable water, call for the use of non-oxygen barrier PEX, offered in several grades. PEX-A, which has the most flexible tubing and best freeze- and kink resistance, is ideal for use with kitchen and bath fixtures. PEX-B is slightly less flexible and less freeze-resistant. Both types of tubing come in three colors—red, white, and blue—in diameters ranging from 1/4-inch to 3 inches. While the tubing is the same regardless of color, it does make it easier to differentiate between hot and cold water lines by choosing red or blue tubing. For indoor plumbing, the most common PEX tubing is one half-inch, which boasts a higher flow rate than copper pipe of the same size. For outdoor applications, “sleeved” versions of non-oxygen barrier PEX are readily available. Since oxygen can cause many heating system components to rust and corrode, baseboard or radiant heating applications require the use of oxygen barrier PEX, offered in grades of PEX-A and PEX-B. The 1/2-inch size is most commonly used; 3/8-, 5/8- and 3/4-inch sizes are also available. Also known as PEX-AL-PEX, aluminum barrier PEX is three-layer tubing that consists of a layer of PEX, a layer of aluminum, and another layer of PEX. Its primary benefit is that once bent, PEX-AL-PEX holds its shape and doesn’t need to be tied down every few feet. The aluminum layer doubles as an oxygen barrier, which in concert with its lower expansion rate, makes PEX-AL-PEX suitable for use in outdoor, warmboard, or high-temperature heating systems. Once you’ve determined which type of PEX tubing you need, you will need to choose the fittings. The easiest to use are brass push-fit fittings, which simply “bite” into the tubing. Though they are more expensive, SharkBite fittings require no special tools, making them ideal for smaller jobs and repair projects. Other types of fittings used with PEX are crimp, clamp, press and compression, any of which are less expensive but require specialized tools. Online retailer Supplyhouse.com sells a wide variety of PEX Tubing, fittings, and tools.